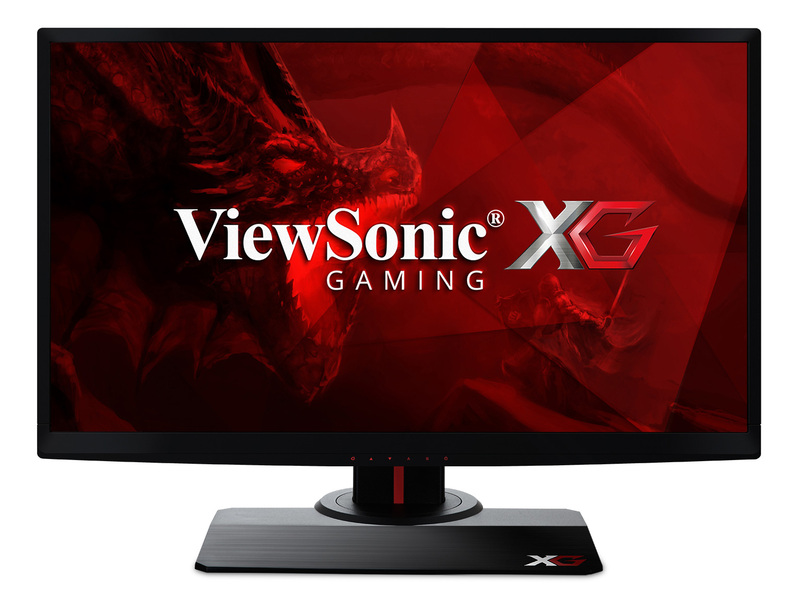 Today we’re looking at one of the fastest monitors on the market: the 240Hz ViewSonic XG2530. 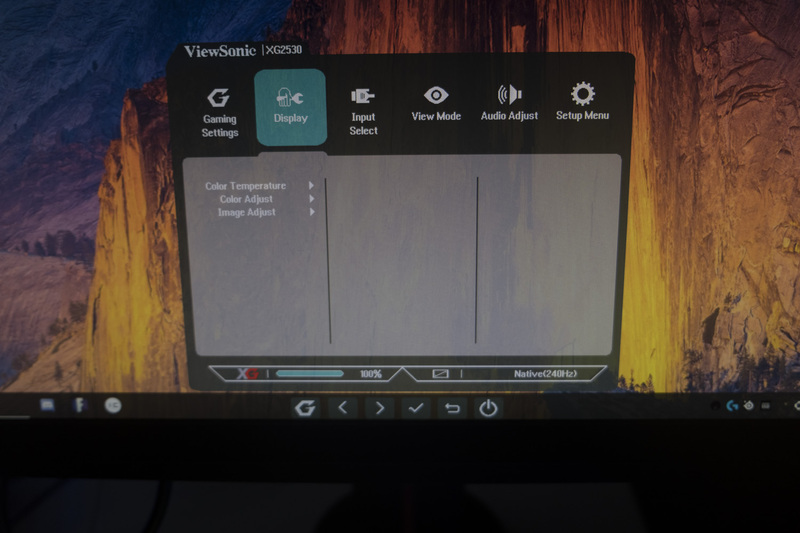 Using the same panel as the BenQ Zowie XL2540, can ViewSonic prove that their implementation is the one to choose for buttery-smooth gaming? Let’s find out! 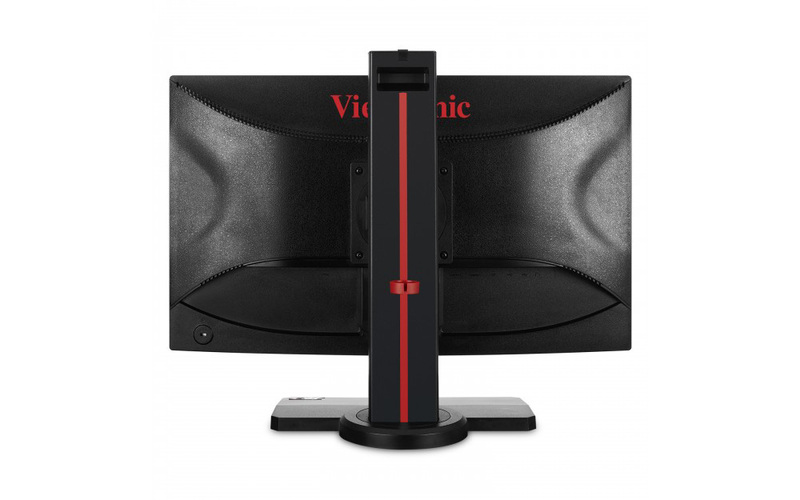 The ViewSonic XG2530 is a stylish monitor with that traditional ‘gamer’ look: black chassis, red trim. It’s a sensible arrangement that melds well with many other gaming peripherals, but I do wish we’d see a little more variety in the marketplace! The ergonomic stand allows for good levels of adjustability, including height adjustment and rotation, while the front-mounted controls are relatively easy to operate. The back of the monitor contains the ports: two HDMI ports, one DisplayPort, a couple USB ports and a 3.5mm output for headphones. The bezels around the TN screen are fairly chunky by modern standards, but you’re probably not going to notice that once you start up your game of choice. 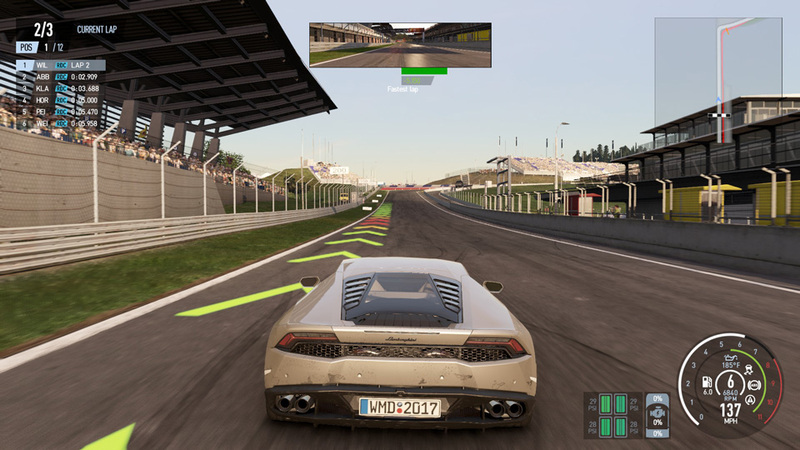 The 240Hz refresh rate makes games silky smooth if your PC can produce the requisite frames per second, although the 1080p resolution does look a little grainy at this 24.5-inch span. That about covers the looks and features of this monitor, so let’s take it for a spin in-game and see how it does! Then, we’ll look at this monitor’s performance in a series of benchmarks to see how it compares to its peers. I’m kind of a nerd (as you may have noticed from this website), so I get really excited about trying out new bits of technology. Seeing 240Hz as an option in the little Windows drop-down menu was certainly enough to get my motor going, and the resulting smoothness made even spinning the mouse cursor on the Windows desktop into a fun game. When you actually start up a bona fide video game, things get even more exciting — if you can hit that 240 frames per second target, you’ll get gloriously buttery gameplay, making it easy to get a bead on incoming opponents. With v-sync turned off, you’ll get super low input lag as well, which also helps your reactivity in-game. The combination makes going back to a 144Hz monitor difficult, and going back to a 60Hz monitor impossible. 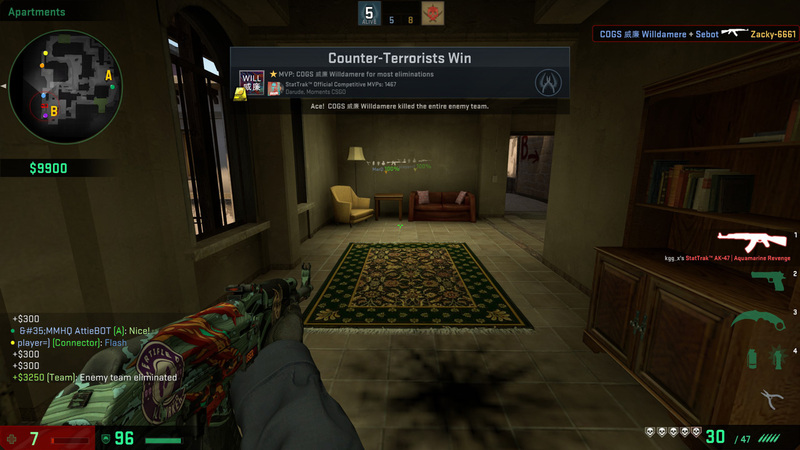 You’ll see the benefit most plainly in twitchy shooters like CS:GO or MOBAs like DotA 2, but that smoothness will be evident even navigating the interfaces of strategy titles or RPGs as well… even if it doesn’t provide any competitive advantage there. 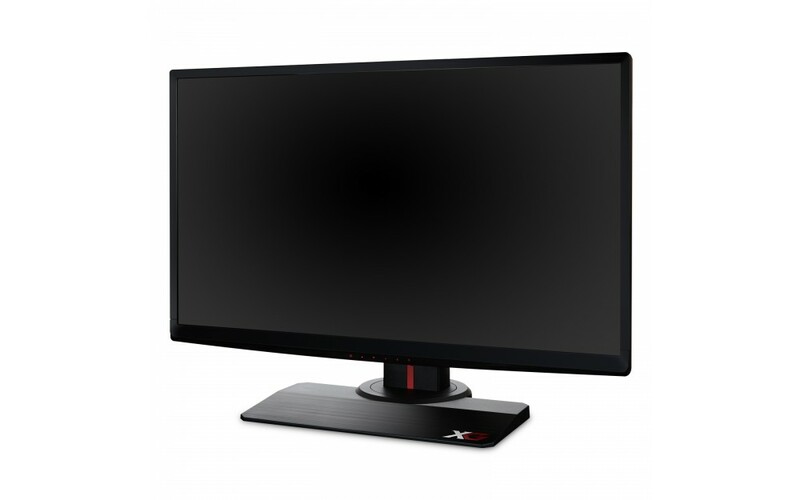 The TN panel in the XG2530 is the same as we reviewed in the BenQ Zowie XL2540, and it boasts among its strengths reasonably good colour reproduction and viewing angles for a panel of this type. It doesn’t quite challenge IPS or OLED monitors in this regard, but it’s certainly a cut above average. That’s important when you’re playing more scenic games like Divinity 2: Original Sin and Civilization VI, and ensures you’re not sacrificing too much in pursuit of the highest possible refresh rates. More of an issue is the 1080p resolution, which is a little low for a 25-inch panel. You’ll see a little graininess in some settings, and I certainly noticed a difference in image clarity switching between the XG and my daily driver, the excellent 1440p Predator XB271HU. However, higher resolution 240Hz panels simply aren’t available at present, and even if they were you’d need a high-end PC to push that many pixels at 1440p or 4K. For now, the trade-off makes sense if you want to give yourself an edge in fast-paced and competitive games. Outside of gaming, I find 1080p is a little limiting in terms of screen real estate. Fitting two tabs side-by-side is a bit of a squeeze, making multi-tasking more difficult, and the lack of vertical resolution means you’ll scroll more frequently in Word documents or webpages. 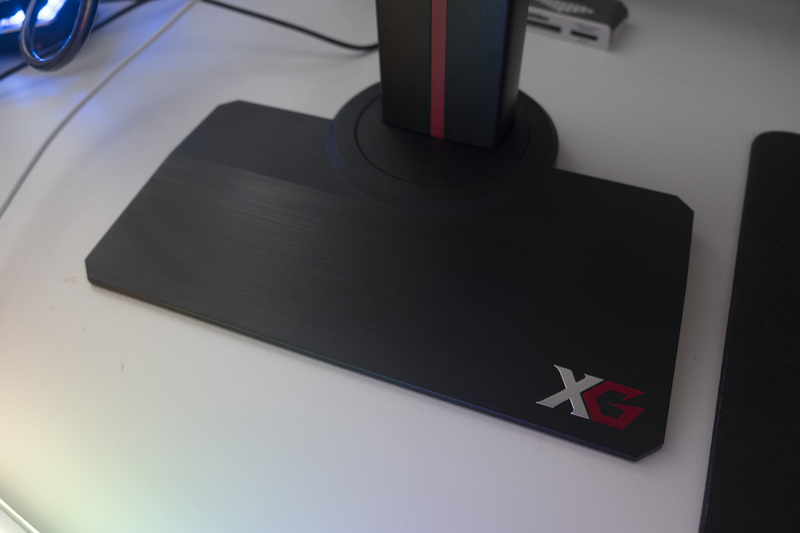 However, with decent colour accuracy and viewing angles, you aren’t likely to run into any other problems with the XG2530. Finally, the biggest gripe I had about the XG2530 was its settings menu; its on-screen display or OSD. The OSD seemed poorly designed, with related settings in arbitrarily different menus and the most common settings several levels down — even changing the brightness. This makes changing settings a bore, which is a shame given how many modes and tweaks are provided, even including different presets for different genres. In order to give the monitor a fair shake, we’ll be examining its performance using our normal suite of benchmarks using the Spyder4Elite colourimeter. To begin, we calibrated the monitor to 120 nits brightness, which corresponded to a brightness setting of 30, contrast of 50 and gamma 2.2. The monitor was set up using the ‘custom1’ preset; all other settings were left at their default values. You can download the ICC / ICM file below, although the standard warning applies: each monitor is different and this may not produce a better result than the factory settings. The initial calibration results show that we’re on target when it comes to white point, with low ΔE (error) values as well — 0.2 and 0.4 are pretty excellent. 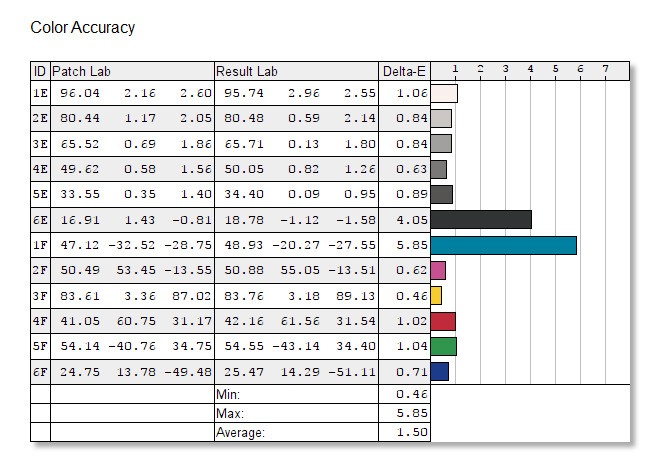 The monitor’s gamma is a little higher than its stated 2.2, but it does improve after calibration from 2.28 to a 2.24. 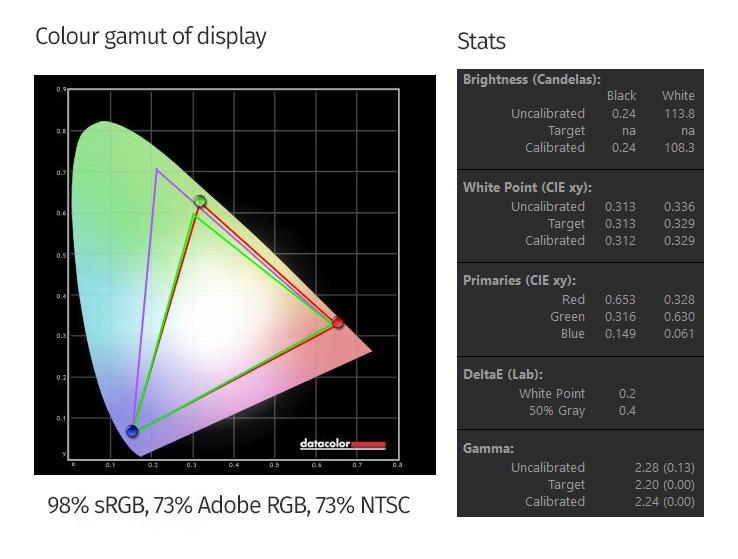 We can also see the colour gamut, which incorporates 98% of sRGB — pretty good for a TN panel. The 73% Adobe RGB and 73% NTSC numbers are less relevant for a gaming-focused panel. It’s interesting to see how contrast is affected by brightness settings. Here, the XG2530 doesn’t turn in a stellar result, with relatively low contrast readings of around 500:1 across the board. Based on past results with the Spyder4Elite overstating black levels, I’d suggest that the XG2530 is bad but not as shocking as the numbers would suggest in this area. Gamma performance looks pretty close to spot on, with a beautifully smooth grey ramp too. Colour accuracy is always an important test, although it’s less so for a competitive gaming model. 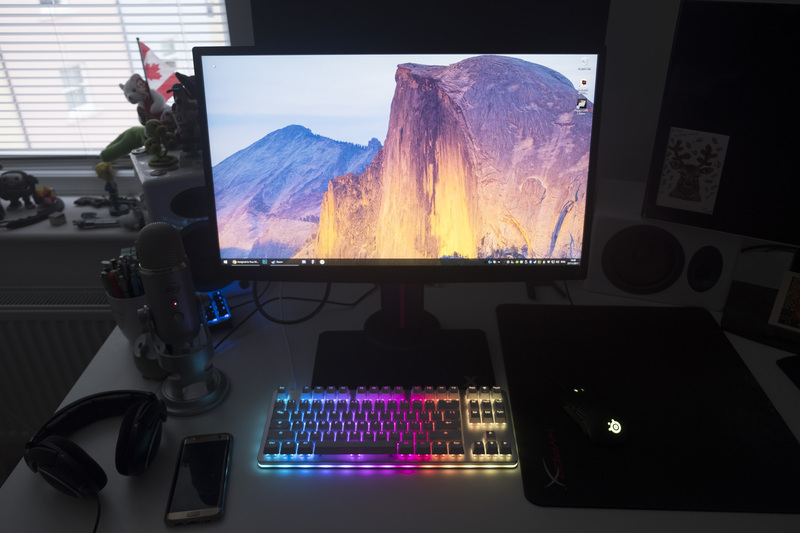 Regardless, we were reasonably impressed with the colour accuracy on show here, with a good Delta E value of 1.50 – among the best we’ve seen for a TN monitor, and very close to the BenQ Zowie XL2540 which uses the same panel. 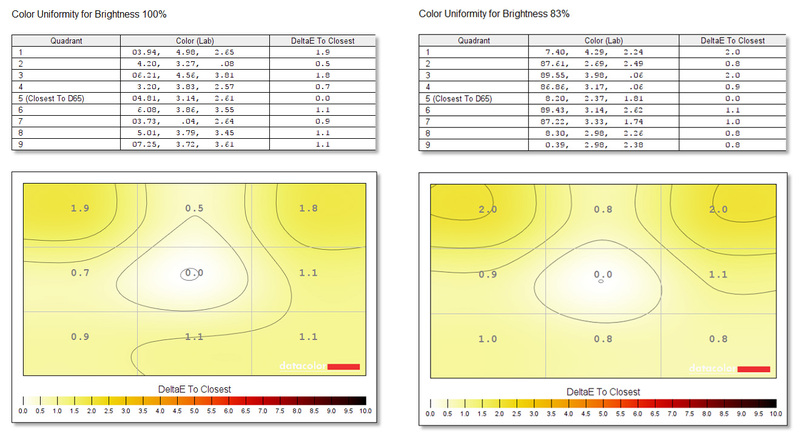 Colour uniformity is good, with Delta-E values at or below 2.0 across the board invariant to brightness. 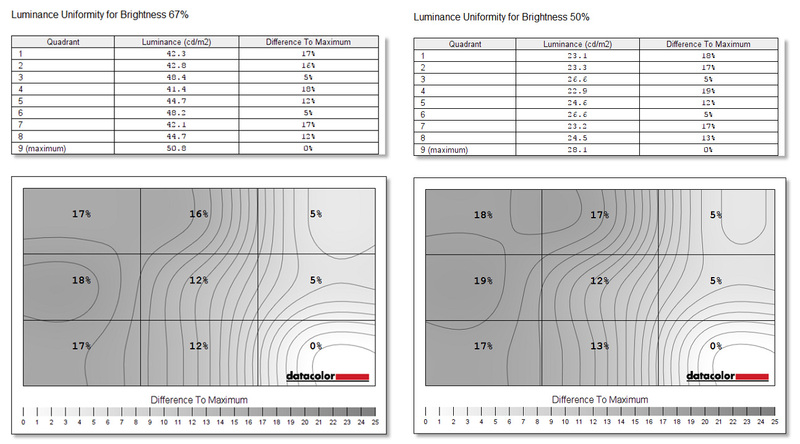 Meanwhile, luminance uniformity was a little worse, with values above 10% in almost every quadrant. 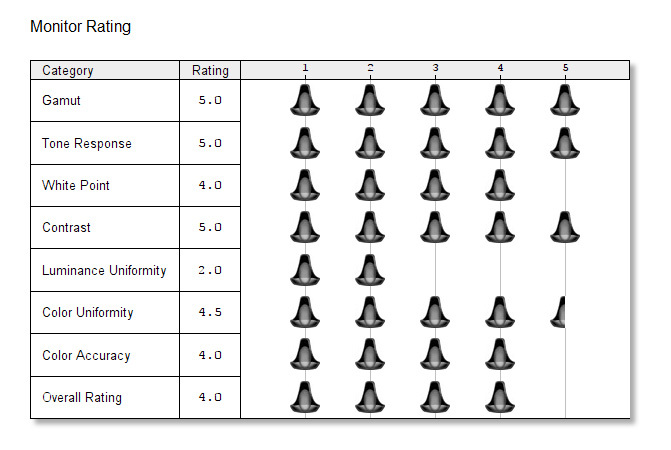 The bottom right quadrant was the brightest in each of our tests by a considerable margin. This is not of massive importance for a gaming monitor, but it’s still not ideal. 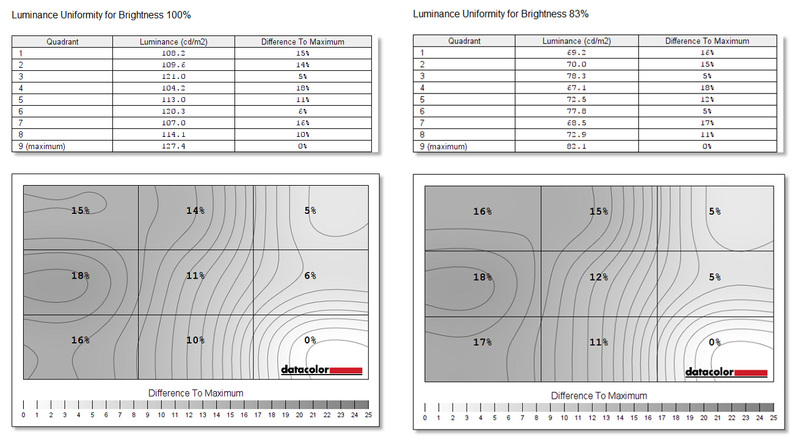 Apart from that poor luminance uniformity rating (and the contrast readings earlier), the XG2530 scores very highly indeed in our tests — just like its bedfellow, the XL2540. These two have received among the highest scores in our colourimeter benchmarks, so good work to AU Optronics on that panel! The ViewSonic XG3530 is another strong implementation of the 240Hz TN panel we last saw on the BenQ Zowie XL2540, boasting excellent in-game performance at the expense of general usability for media or web surfing. While the BenQ Zowie monitor has a longer feature list than the ViewSonic we tested today, including an OSD controller and an anti-glare shield, both models offer similar in-game performance and adjustability… and the ViewSonic is about £20 cheaper online. No matter which you choose, you’re in for a treat.